Families today are choosing the heat pump option due to its ability to combine both heating and cooling in one simple system. 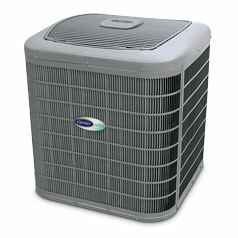 The experienced technicians at Treat’s Heating and Cooling have been installing heat pumps in Washington for decades. When choosing the heat pump that is right for you, make sure you choose a company you can count on for their knowledge and skill like Treat’s Heating and Cooling. While most homeowners love the idea of having a heating and cooling system in one like the heat pump provides, they are also thrilled to discover that it also uses less energy than other HVAC systems. Because the heat pump uses air as its source, it does not need to use energy to convert fuel to heat like other heating systems. Heat pumps transfer the heat from the outside air into your home and uses a limited amount of energy to run the air handling unit. This means big savings for your monthly bill. If you want to guarantee you will get the most out of your heat pump, regular professional maintenance is key. You have a direct impact on increasing the lifespan of your heating system by properly maintaining your system. When our technicians have the opportunity to look at your system, it allows them to identify any potential problems that may end up costing you greatly later down the road. Minor adjustments made by a trained professional can prevent major costly repairs. Our expert technicians will look over your entire system and clean all the working parts, replace any parts that are worn or broken and also ensure all outdoor components are functioning properly. 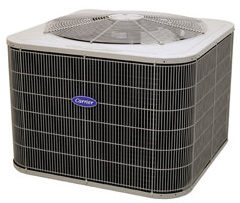 Regardless of what type of issue you may be experiencing with your heat pump, our experienced team will quickly troubleshoot the problem and correct the issue as quickly as possible. 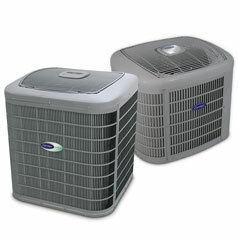 While we are an official partner with Carrier brand products, we service any make and model of heat pump. We guarantee your complete customer satisfaction so you can be confident relying on the team at Treat’s Heating and Cooling. Although you may have taken great care at maintaining your heat pump, all systems will eventually wear out and will need replacement. Should you be in a position of needing to replace your heat pump, give us a call and we will guide you through the process and offer a complete spectrum of newer, more energy efficient heat pumps on the market. 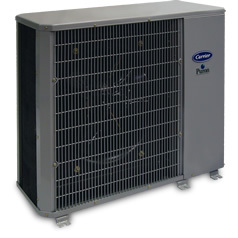 The Advanced Carrier Infinity® Series heat pump offers the highest efficiency, and our Performance™ Series and Comfort™ Series heat pumps provide economical comfort-the higher the SEER and HSPF ratings, the more efficient. Plus, add a Carrier gas furnace and enjoy additional heating in what we call “HYBRID HEAT® dual fuel system”, the most cost-savings system you can buy. 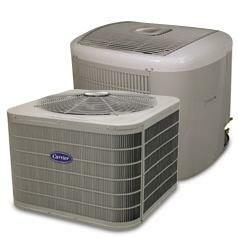 Even though Carrier is our preferred Brand of choice, we service & maintain all major brands of Heat Pumps. Please call for any questions regarding any Brand of your choice. We would be happy to serve you!